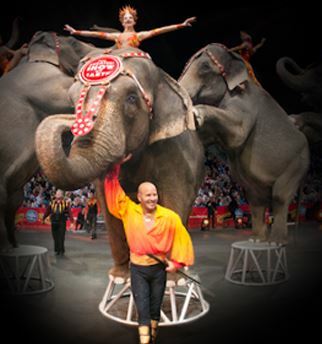 Ellenton, Florida — The Feld Family, owners of Feld Entertainment, Inc., the parent company of Ringling Bros. and Barnum & Bailey®, announced plans Thursday to remove Asian elephants from their traveling circus performances. Under the plan, 13 elephants currently traveling with the three Ringling Bros. circus units would be relocated to the Ringling Bros. Center for Elephant for Conservation® in Florida, by 2018. There they would join the rest of the Ringling Bros. herd of more than 40 elephants. The Ringling Bros. Center for Elephant Conservation is already home to the largest herd of Asian elephants and the most successful breeding program for this endangered species in the Western Hemisphere. The circus will continue to feature other extraordinary animal performers, including tigers, lions, horses, dogs and camels. This unprecedented change in the 145-year-old Greatest Show On Earth® will allow the company to focus on its Asian elephant conservation programs, both here in North America and through its partnership with the island nation of Sri Lanka. The company will also continue to collaborate with other conservation organizations working to preserve this magnificent species for future generations. For example, the company has placed elephants at eight zoos, either on loan or through donations, and will continue to support the Smithsonian Institution’s research lab working to find a cure for diseases that impact juvenile elephants. Ringling Bros. use of elephants has been under scrutiny for yeas. It has been repeatedly criticized — and even sued — by several animal rights groups, including the American Society for the Prevention of Cruelty to Animals and the Humane Society of the United States. “This is the most significant change we have made since we founded the Ringling Bros. Center for Elephant Conservation in 1995. When we did so, we knew we would play a critical role in saving the endangered Asian elephant for future generations, given how few Asian elephants are left in the wild,” said Kenneth Feld, Chairman and CEO of Feld Entertainment. “Since then, we have had 26 elephant births. No other institution has done or is doing more to save this species from extinction, and that is something of which I and my family are extremely proud. This decision was not easy, but it is in the best interest of our company, our elephants and our customers,” he added. “Our family has been the proud steward of the American institution that is Ringling Bros. and Barnum & Bailey, and our elephants, for 45 years. It is a legacy that we hold near and dear to our hearts, and as producers of The Greatest Show On Earth, we feel we have a responsibility to preserve the esteemed traditions that everyone expects from a Ringling Bros. performance while striving to keep the show fresh and contemporary for today’s families,” said Nicole Feld and Alana Feld, Ringling Bros. producers and Executive Vice Presidents with Feld Entertainment. “As the circus evolves, we can maintain our focus on elephant conservation while allowing our business to continue to meet shifting consumer preferences,” they added. Ringling Bros. said it could no longer afford to fight the legal battles. Animal rights activists such as PETA said this is a huge victory.